To is exactly "Hoover, Herbert, 1874-1964"
Joseph Tumulty recommends Mr. William Heyliger for the job of writing a book on food conservation intended for children to Herbert Hoover. Woodrow Wilson reminds Herbert Hoover that in light of the need to conserve coal, there was a provisional agreement to stop the production of malt products. Joseph Tumulty notifies Herbert Hoover that Woodrow Wilson has signed the Executive Order fixing wheat prices. Woodrow Wilson tells Herbert Hoover that he will be glad to supply the necessary capital if the full amount is approved in the pending Sundry Civil Appropriation Bill. Woodrow Wilson supports Herbert Hoover’s decision to go abroad and consult with the Food Administrators of France, England, and Italy. Woodrow Wilson agrees with Herbert Hoover’s arrangements communicated in monthly reports of the Food Administration will be satisfactory. Joseph Tumulty sends Herbert Hoover a letter excerpt, written by a friend, that contains a suggestion he thinks requires attention. Woodrow Wilson tells Herbert Hoover that if Morris Sheppard is willing for his letter to be made public, he supports the idea of doing so. 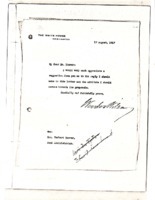 Joseph Tumulty notifies Herbert Hoover of the President’s wishes to consult a District Commissioner regarding property value when purchasing real estate. Woodrow Wilson thanks Herbert Hoover for his letter and approves the conclusions of the report from the Packing Industry Committee. 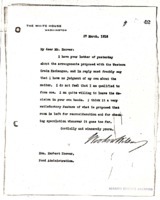 Woodrow Wilson asks Herbert Hoover about Mr. Colver’s plan. 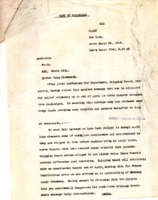 Joseph Tumulty notifies Herbert Hoover that the President has signed and sent the proclamation regarding additional food operators excepted from prior proclamations. 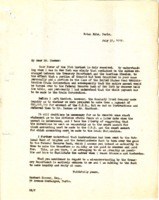 Joseph Tumulty sends Herbert Hoover a copy of a letter by Edward Chambers. Woodrow Wilson encourages Herbert Hoover to avoid transferring existing federal employees to other departments and to seek new staff from outside Washington. Tumulty notifies Herbert Hoover of Woodrow Wilson’s approval of Mr. Frank H. Brooks nomination to Federal Food Administrator for Vermont. 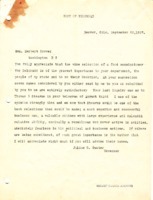 Woodrow Wilson writes to Herbert Hoover about the matter of appointing a State Food Administrator for Virginia. On behalf of the President, Joseph Tumulty asks Woodrow Wilson to consider the matter in the enclosed letter from Mr. Thomas D. Campbell. On behalf of Woodrow Wilson, Joseph Tumulty asks Herbert Hoover whether the Federal Trade Commission should be made public. 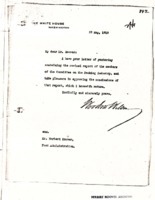 Woodrow Wilson sends Herbert Hoover a copy of a report from the Federal Trade Commission. 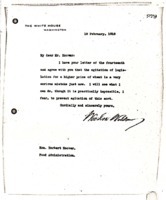 Due to his conflicting interests, Woodrow Wilson asks Herbert Hoover to replace F.W. Taussing in the milling inquiry. Woodrow Wilson thinks it is permissible to publish and proceed with the appointment of a commission to deal with the meat problem. Woodrow Wilson confirms the appointment of J.H. 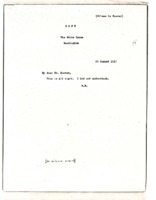 Skinner as the representative of the Food Administration on the Inter-Allied Council. 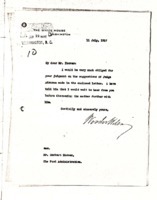 Woodrow Wilson defers to Herbert Hoover’s judgement regarding the Wester Grain Exchanges. 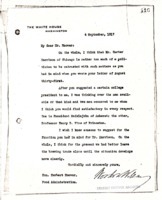 Woodrow Wilson thanks Herbert Hoover for sending Mr. Barnes’ letter. 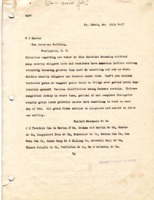 Joseph Tumulty sends Herbert Hoover a letter by Mr. Eugene. 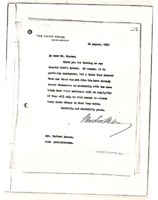 Woodrow Wilson thanks Herbert Hoover for his reply to Colonel Hudson’s telegram about meat production and corn prices. 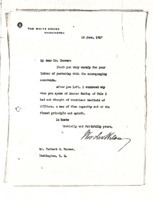 Woodrow Wilson asks Herbert Hoover to suggest an answer to the enclosed telegram. 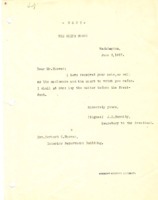 Joseph Tumulty asks Herbert Hoover to return the papers Wilson had sent him when seeking his comments. 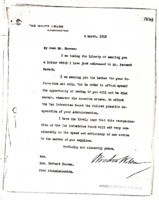 Woodrow Wilson asks Herbert Hoover to attend a meeting with him and several other men. Woodrow Wilson replies to Herbert Hoover saying that regardless of a potential shortage at home, wheat supplies must be sent overseas because he is confident that the American people will willingly face this sacrifice. 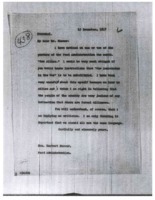 Woodrow Wilson thanks Herbert Hoover for his letter and returns the correspondence he sent to him. 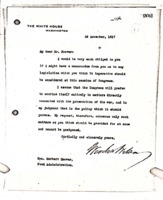 Woodrow Wilson asks Herbert Hoover for a memorandum of any legislation from the Food Administration that Congress will need to consider before they recess. Woodrow Wilson defers to Herbert Hoover’s judgment regarding prices of food and fuel since he does not have his detail of knowledge regarding these issues. Woodrow Wilson suggests that the Food Administration make use of state and local committees as councils for defense since US entry into World War I.
Woodrow Wilson tells Herbert Hoover that he must act according to his plan in New York. Woodrow Wilson approves of Herbert Hoover’s action regarding milk. 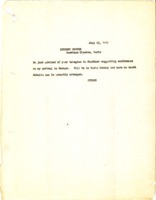 Woodrow Wilson thanks Herbert Hoover for his memorandum about Gifford Pinchot. Woodrow Wilson responds to Herbert Hoover’s letter about relations between the food supply and brewing industry. Tumulty asks Herbert Hoover if the Food Administration has anything planned for Sunday, December 9th that should preempt Bible Sunday. Woodrow Wilson affirms Herbert Hoover’s strategy regarding New York. 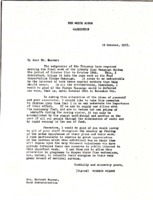 Woodrow Wilson thanks Herbert Hoover for his memorandum about the crop situation. 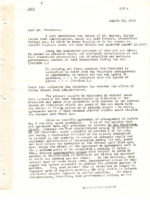 Tumulty informs Herbert Hoover that Woodrow Wilson has signed the proclamation regarding licensing the arsenic industry. 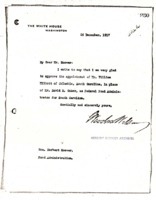 Tumulty notifies Herbert Hoover that Woodrow Wilson signed a draft executive order referenced in his letter of November 10th. 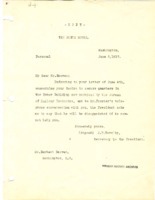 On behalf of Woodrow Wilson, Joseph Tumulty returns Herbert Hoover and Harry A. Garfield’s letter saying the President is willing to sign an executive order as they requested provided that it is carefully drawn as a temporary service. Woodrow Wilson approves Herbert Hoover’srules and regulations for the importation, manufacture, storage, and distribution of food. 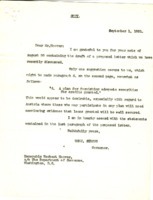 On behalf of Woodrow Wilson, Joseph Tumulty sends Herbert Hoover a letter by Richard H. Edmonds. 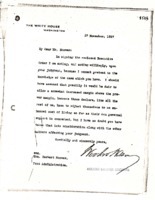 Joseph Tumulty asks Herbert Hoover to send suggestions to the President regarding his Thanksgiving Proclamation. Joseph Tumulty transmits an invitation to Herbert Hoover from the Lotos Club of New York City to speak at a dinner in December. 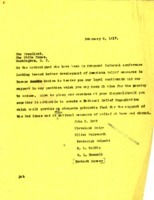 On behalf of Woodrow Wilson, Joseph Tumulty sends Herbet Hoover a cablegram and asks for his response in the form of a memorandum. 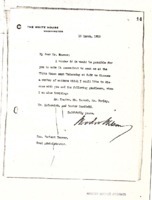 Joseph Tumulty sends Herbert Hoover a letter from James T. Allen for his verification. Joseph Tumulty informs Herbert Hoover that the President usually prepares and issues his Thanksgiving Proclamation one month in advance of Thanksgiving Day. Woodrow Wilson asks that Herbert Hoover defer the Food Campaign in order to allow maximum support for the Liberty Loan Campaign. Woodrow Wilson asks Herbert Hoover to defer the Food Campaign one week in order to allow the Liberty Loan to finish and proved for better reception of both. 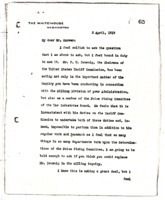 Joseph Tumulty asks for clarification from Herbert Hoover about Mr. J. A. Hall of Chicago. 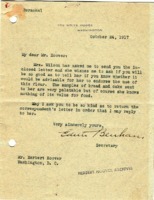 Joseph Tumulty sends a copy of Bernard Baruch’s letter in support of Hoover’s suggestions regarding sales of food to Allied governments. 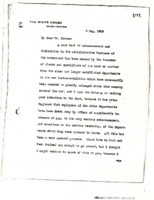 R. W. Steer writes in support of Thomas B. Stearns’ appointment to the post of Food Administrator. 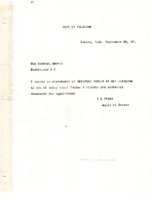 Julius C. Gunter, Governor of Colorado, writes in support of Thomas B. Stearns’ appointment to the post of Coal and Food Administrator. Woodrow Wilson asks Herbert Hoover to reconsider the nomination of Mr. Stearns as coal and food administrator in light of protests about it. 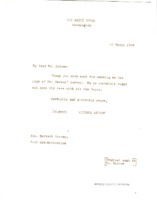 Woodrow Wilson tells Herbert Hoover that he does not recognize the name of Stearns and would only have approved him if he had been on the list given him by Hoover. Josephy Tumulty asks what form the President’s statement should take regarding wheat prices. 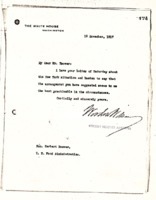 Josephy Tumulty thanks Herbert Hoover for his letter and promises to bring the matter up with the President. Josephy Tumulty tells Herbert Hoover that Woodrow Wilson has approved his appointees to the Federal Food Administration. Woodrow Wilson asks Herbert Hoover to meet with the Secretary of Agriculture to discuss the pork supply in the United States. Joseph Tumulty tell Herbert Hoover that President Wilson as signed an executive order regarding the IRS enforcing certain provisions of the Food and Fuel Control Act. 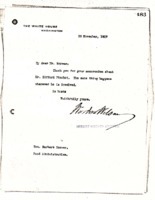 Woodrow Wilson approves Herbert Hoover’s request for Mr. Taussig to investigate the grain division. 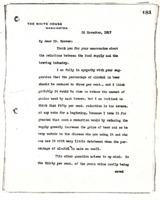 Woodrow Wilson writes to Herbert Hoover about efficiency in food packing. 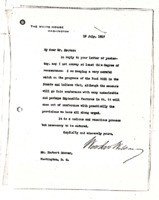 Woodrow Wilson writes to Herbert Hoover concerning beef prices being controlled by the packers. 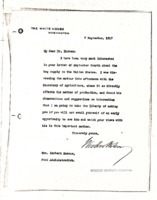 Woodrow Wilson writes to Herbert Hoover about wheat price legislation. 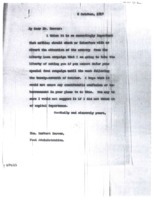 On behalf of Woodrow Wilson, Charles Swem sends Herbert Hoover a cablegram from the Allied Governments regarding wheat needs. Woodrow Wilson agrees with Herbert Hoover discouraging expansion in a number of food industries that are already producing sufficient quantities since that expansion would raise the cost of production and increase the demand for labor. 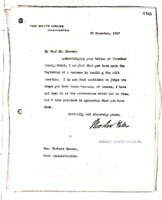 Joseph Tumulty notifies Herbert Hoover that Woodrow Wilson has received his letter and draft of rules for conservation. 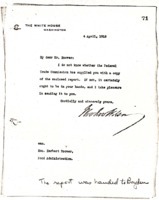 Woodrow Wilson asks for Herbert Hoover to respond to MCAdoo’s suggestion that the Food Administration be representated at the Inter-Allied Council. On behalf of the President, Joseph Tumulty sends Herbert Hoover a letter from the Secretary of Labor. 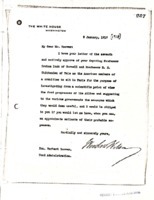 Tumult sends a letter from Isidor Jacobs, president of the California Canneries Company to Herbert Hoover. 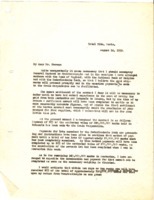 Joseph Tumulty asks for Herbert Hoover’s perspective on the enclosed letter from Charles R. Reid of the Bronx Board of Trade. 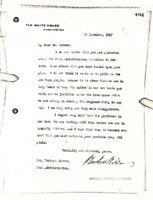 Joseph Tumulty informs Herbert Hoover that the President has signed the draft proclamation about licensing businesses dealing in food products. Joseph Tumulty tells Herbert Hoover that Congressman Ferris wants him to stop in Oklahoma City on his trip West. 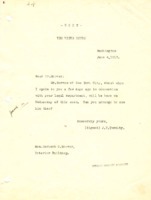 Tumulty notifies Herbert Hoover of Woodrow Wilson’s approval and returns a letter from Colonel House. 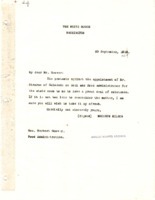 Edward M. House suggests William A. Glasgow as a potential for Chief Counsel if Herbert Hoover has not already secured someone for that role. Woodrow Wilson proposes Samuel Utermyer as a replacement for Judge Lindley, since he is someone who will be able to withstand the efforts of Senator Reed. Woodrow Wilson approves Herbert Hoover’s nomination of William Elliott in the place of David R. Coker as Federal Food Administrator for South Carolina. 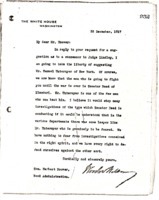 Tumulty asks when Herbert Hoover can meet with Mr. Tobey and Mr. Park. Tumulty asks Herbert Hoover if President Wilson should decline to receive candy given as a gift due to the present sugar shortage. Woodrow Wilson tells Herbert Hoover to substitute “Our Associates in the War” for “Our Allies” on posters of the Food administration since there is no formal alliance. 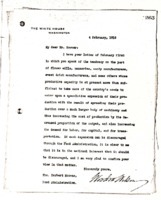 Tumulty informs Herbert Hoover that Woodrow Wilson signed the draft proclamation accompanying his letter about limiting the alcoholic content of beer and the amount of grain used in brewing. 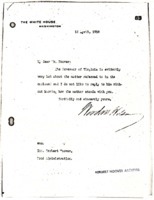 Tumulty tells Herbert Hoover that Woodrow Wilson agrees with his conclusions about TE Wilson’s letter. Governor Richard Manning sends a speech he is preparing to give to the people of South Carolina on food conservation for his endorsement. Joseph Tumulty sends Herbert Hoover a letter from Governor Manning asking him to give the President his opinion. Woodrow Wilson proposes two other names that would be better suited to the position Herbert Hoover mentioned than Carter Harrison. Woodrow Wilson thanks Herbert Hoover for his letter regarding accounting for funds to be spent by the Food Administration Grain Corporation. Woodrow Wilson comments on the grain and elevator dealers that he and Hoover had met with and asks Hoover to send them his admiration and appreciation. 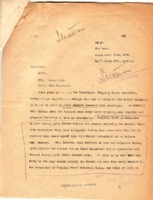 Charles Swem asks that Herbert Hoover clarify the information he sent to Woodrow Wilson. Woodrow Wilson comments on the divisive letter that Herbert Hoover had forwarded to him. Thomas Gregory acknowledges Herbert Hoover’s question and advises Woodrow Wilson on the role of the U.S. Food Administrator and the amount of control the president has over the Food Administration. 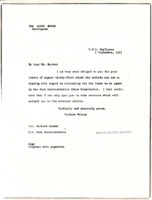 Thomas Gregory sends a copy of his letter to Wilson regarding the U.S. Food Administrator to Herbert Hoover. Woodrow Wilson approves Herbert Hoover’s list of appointments. 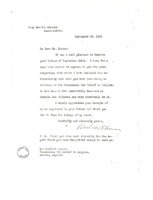 Joseph P. Tumulty thanks Herbert Hoover for his letter. 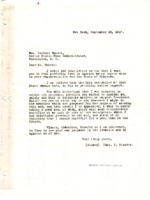 Joseph P. Tumulty forwards a request from Congressman Gray of New Jersey to Herbert Hoover. 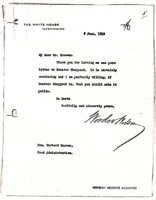 Woodrow Wilson asks Herbert Hoover for advice on how to reply to a certain letter. 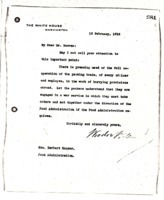 Rudolph Forster notifies Herbert Hoover that he has asked the Comittee on Public Information to publish the president’s proclamation on wheat and rye elevators and mills, as per Hoover’s suggestion. 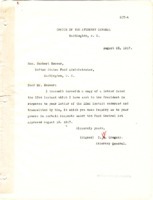 Rudolph Forster tells Herbert Hoover of Woodrow Wilson’s objection to a representative of Stone & Webster be appointed to the Food Administration due to the firm’s business practices. Woodrow Wilson agrees with Herbert Hoover. Rudolph Forster informs Herbert Hoover that Woodrow WIlson has approved the proposed staff for the fair price committee for 1917 wheat prices. 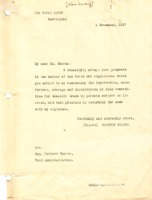 Curtis Lindley sends Herbert Hoover a letter to sign and present to Woodrow Wilson in an attempt to settle the controversy of the Franking privilege. On behalf of Joseph Tumulty, Thomas Johnson acknowleges receipt of Herbert Hoover’s letter. 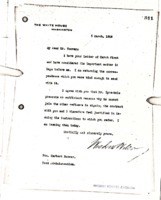 Rudolph Forster informs Herbert Hoover that Woodrow and Edith Wilson are incapacitated by temperament from making a motion picture to use in promotion of the Food Administration. Sharing Woodrow Wilson’s perspective, Josephy Tumulty tells Herbert Hoover that exemption from military service for anyone connected with the Food Administration will be left to the district exemption boards. 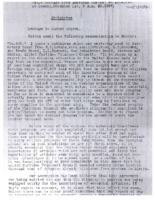 Joseph Tumulty sends Herbert Hoover a page from the Congressional Record containing a statement about Frank Cary. Joseph Tumulty acknowleges receipt of Herbert Hoover’s letter and agrees to bring it to the President’s attention. Joseph Tumulty asks Herbert Hoover to read the enclosed clippings. Josephy Tumulty sends Herbert Hoover several editorials. Woodrow Wilson assures Herbert Hoover that he is monitoring the progress of the Food Bill and is sure that it will contain the provisions they have discussed. 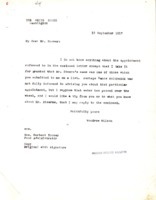 Woodrow Wilson sends Herbert hoover William Adamson’s letter and asks for his judgment on it. 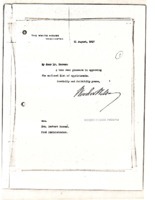 Grain companies write to Herbert Hoover asking for tentative plans or suggested prices until legislation is passed regarding wheat. 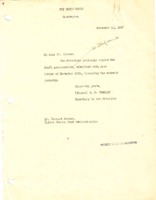 Joseph Tumulty sends Herbert Hoover a letter from Charles E. Lambert, saying he will take the matters mentioned in the letter up with the President. Joseph Tumulty relays to Herbert Hoover, Woodrow Wilson’s decision not to make a proclamation. 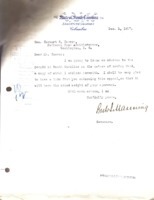 Tumulty thanks Herbert Hoover for sending him a copy of the letter from Mr. Stacey at the Census Bureau. 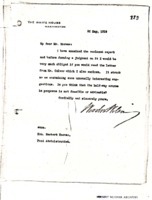 Woodrow Wilson approves an additional $20,000.00 to Herbert Hoover from the funds allocated for National Security and Defense. NP Webster sends Herbert Hoover a check for expenses totaling $4,081.00. 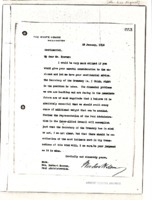 NP Webster writes to Herbert Hoover enclosing a voucher covering the bills submitted totalling $4,081.00. On behalf of Woodrow Wilson, Joseph Tumulty notifies Herbert Hoover that he acted as directed regarding the Lever Food Bill. Joseph Tumulty acknowledge receipt of Herbert Hoover’s note with enclosure for Woodrow Wilson. 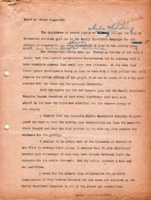 Enclosing a letter from Governor Edge about Mayor Wittpen, Joseph Tumulty asks to speak to Herbert Hoover. 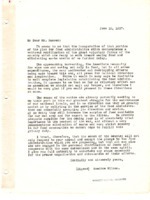 Woodrow Wilson thanks Herbert Hoover for his letter and accompanying memoranda. Woodrow Wilson writes to Herbert Hoover supporting the deployment of volunteers, particularly women, in food conservation efforts around the country. Joseph Tumulty expresses Woodrow Wilson’s desired support for Herbert Hoover’s desire to secure quarters in the Homer Building. Joseph Tumulty asks if Herbert Hoover can meet with Mr. Garvan of New York City. 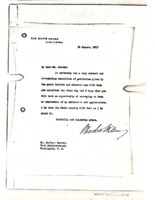 Joseph Tumulty acknowledges receipt of Herbert Hoover’s letter with chart to Woodrow Wilson. Edgar Rickard and Theodore F. Whitmarsh tell Herbert Hoover about the difficulties in shipping the needed tonnage of supplies to Europe. Joseph Tumulty acknowledges receipt of Herbert Hoover’s letter and enclosure to Woodrow Wilson. Joseph Tumulty encloses letters from Eugene Ong and asks Herbert Hoover to comment on the food supply. Joseph Tumulty introduces Herbert Hoover to Judge TT Ansberry. Tumulty tells Herbert Hoover that he was not able to arrange a meeting with President Wilson, owing to his poor health and need for rest. 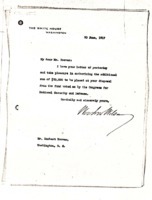 Joseph Tumulty agrees to bring the prepared note from Herbert Hoover to Woodrow Wilson’s attention as early as possible. Those concerned with developing better American relief efforts sign this petition. Joseph Tumulty notifies Herbert Hoover of his scheduled appointment with the President on January 31, 1917. Woodrow Wilson thanks Mr. and Mrs. Hoover for their work on behalf of Americans in London, England. 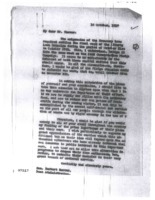 Letter sent along from the embassy in London about shipping of food supplies. 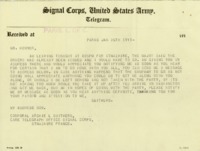 Archie L. Smithers writes [Irwin H. Hoover] to send his address in St. Nazaire, France. 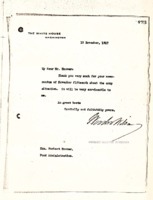 Benjamin Strong Jr. replies to Herbert Hoover regarding a draft letter on eastern European relief efforts. 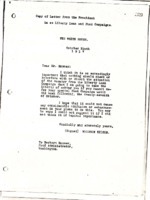 Benjamin Strong Jr. writes Herbert Hoover regarding the sale of German gold. 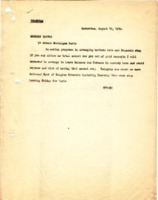 Benjamin Strong Jr. writes Herbert Hoover to tell him that the gold shipment will proceed promptly. Benajmin Strong cables Herbert Hoover that he is making progress arranging matters in Paris and Brussels and will arrange to have the balance due in gold deposits paid. Benjmain Strong Jr. informs Herbert Hoover of his travel plans.